The truth is that there are at least 25 viable metrics you can use to evaluate the success of your social media efforts. The challenge isn’t measurability, it’s knowing which measures are meaningful. Here are the 6 critically undervalued social media success metrics. Instead of just counting the number of Facebook “likes” you accrue – which signifies nothing more than digital bumper stickering, instead track how often your fans click “like” and comment upon the status updates you post. The more fans that click “like” and comment, the more likely your future updates are to be seen in their News Feed, dramatically increasing your actual Facebook audience. Rather than paying rapt attention to the number of Twitter followers you’ve corralled, instead look at your Klout score. Klout is an online influence gauge that combines several data points (followers, retweets, clicks on links, etc.) and then applies some fancy algorithmic voo doo to arrive at a unified metric. The data used to calculate Klout continues to change (they added Facebook information recently), but I have found it to be the most reliable influence tracking metric. By no means perfect, but much more illustrative than follower counts. Free if you connect with their “influencers” outreach program, or $15/month if you do not, PostRank provides a useful, detailed blogging scoreboard, especially if you connect it with your Google Analytics account. 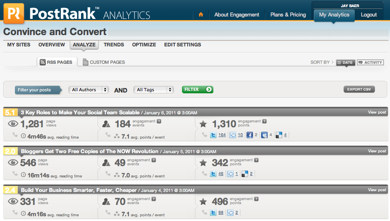 The best part of PostRank Analytics is the Engagement Score, which is sort of your Klout score for each blog post. The system looks at total comments, tweets, shares, etc. for each post and applies behavior points and an algorithm to determine the total score. This is a fantastic way to look at your last 25 blog posts to see what type of content you’re publishing generates the most engagement. To add a reference point to your social mention tracking, create a Share of Voice report. To do so, determine the number of times your company and its products are mentioned on the social Web in a neutral or positive context over a 30 day period. You’ll want to use Radian6, ViralHeat, Spiral 16, Sysomos, Social Mention or any of the other social listening tools for this project. Then determine how often your competitors are mentioned (neutral or positive) during the same 30 days. Add up all mentions for the category (you + your competitors), and then divide your mentions by the total to calculate your Share of Voice – which is always a percentage. Usually, Share of Voice reports are formatted as a pie chart, so you can easily see how you fare versus your competition. Perhaps more than any other marketing metric, the number of people that are searching for your brand on Google serves as a catch-all metric for market awareness. The tie between search and social media cannot be overestimated. Perhaps the best study on the subject – from GroupM in 2009 – found that consumers exposed to a brand in social media are subsequently 2.8 times more likely to search for that brand than are consumers unexposed within social media. Use Google Insights to examine whether or not searches for your company and products are increasing over time, and if your volume is going up, and your competitors’ isn’t – double bonus! Social media is one of the best places to accrue links, because we social types are prone to link from blog posts, within blog comments, etc. Track the number of links pointing to your website and/or blog, and examine the source of new links. How many links do you have, in comparison to your competitors? What sites are linking to them, that perhaps you could get to link to you as well? There are several inbound link tracking services online. 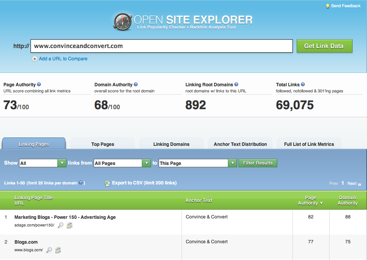 My favorite is Open Site Explorer from SEOmoz. The free version allows you to track and report on up to 1,000 links. If you’re looking for a magic number that automatically determines your social media prowess, you’re not going to find it. Instead, the secret to tracking social media is tying together disparate data sources, and selecting the metrics that make the most sense for your company. And those are never the obvious ones like Facebook fans and Twitter followers. Tracking social media may not always be easy and fast, but it’s absolutely, 100% doable.